elmex Multi Level Terminals are the perfect solution where space is a constraint and high density wiring is needed. The compact design of these Terminals with 6 mm thickness allows double wiring density and reducing the total number of terminal blocks to half. elmex three level terminal blocks can be used for high-density wiring and for wiring special equipments such as proximity sensors. elmex 8-level terminal block type DS8L offers very good wiring density particularly for marshaling applications where large number of wires are to be terminated and space is a constraint. 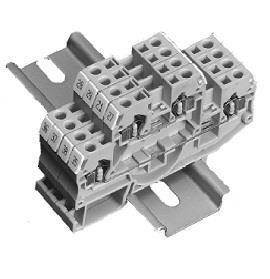 Screwless multi-level terminal block wire termination is by spring clamp mechanism. Spring clamps are made using special grade austenitic stainless steel material having very good spring properties, high fatigue strength, high tensile strength and better resistance to corrosion effects.